MAN Truck & Bus gives the green light for its convey joining the “European Truck Platooning Challenge 2016' being run by the Dutch government as part of their EU Presidency. The aim of the project is to explore the potential in terms of road safety and to increase the efficiency of road freight transport. In specific terms, the project intends to reduce CO2 emissions by employing 'slipstream driving', whilst simultaneously improving traffic safety on motorways by lightening the burden on drivers. MAN Truck & Bus is participating in this research project by providing test vehicles. The MAN convoy, or 'platoon', consisting of two MAN TGX 18.480 semitrailer tractors, set off from Munich on 4 April 2016 heading for Rotterdam, which will host a demonstration of technology from all participating manufacturers on 6 April 2016 ahead of the meeting of EU transport ministers. "Economy and environmental compatibility will require new strategies in the future. While consumption in the traditional automotive industry can only be adjusted to a limited extent through improvements in aerodynamics, lightweight construction and drive technology, digital innovations can deliver significantly greater economy," says Joachim Drees, CEO of MAN Truck & Bus AG. One possibility would be travelling in platoons. 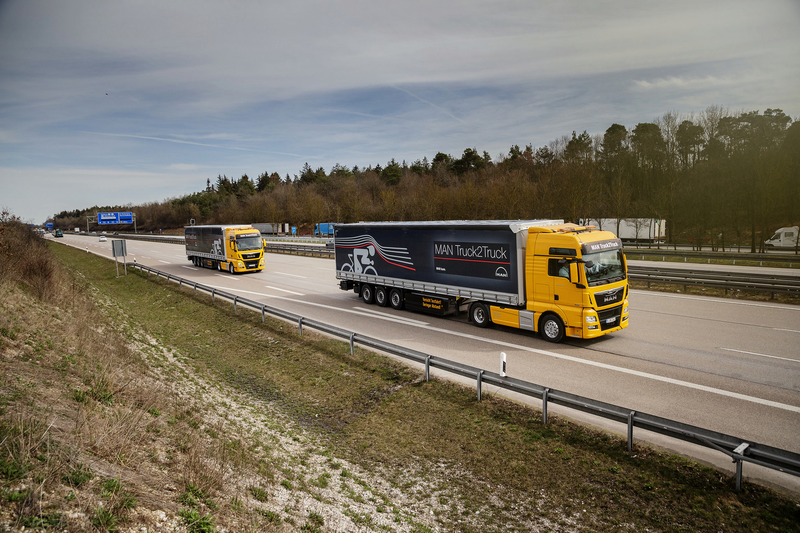 Platooning involves two or more truck and trailer combinations travelling in close proximity with the aid of technical driver assistance and control systems and car-to-car communication, whilst simultaneously enhancing road safety. Thanks to this electronic 'tow bar', the longitudinal and lateral control of the vehicle to the rear is automated; in other words it follows the HGV in front. Here, the distance between each semitrailer combination is under 15 metres or around half a second of driving time. 'Slipstream driving' set up in this way enables fuel savings, depending on vehicle type and the length of the convoy, of up to ten percent for the whole platoon, bringing with it a reduction in CO2 emissions. The desired effects are best achieved at a speed of 80 km/h. Experts also expect platooning to improve traffic flow on motorways, meaning improved traffic safety and a more efficient traffic system. Around 90% of all traffic accidents are attributable to human error, with 'longitudinal traffic accidents' such as rear-impact crashes in freight transport making up the lion's share of these, at almost 70 percent. According to the German Federal Statistical Office, the greatest source of risk on motorways is not maintaining a large enough distance. The use of modern assistance systems helps to prevent precisely this kind of situation. As platooning can only be used in the most modern vehicles, this technology will contribute to an increase in safety on the roads as a whole. Technically speaking, it is conceivable that the platoon concept will be introduced in Europe by 2020. However, whether or not this becomes a reality will depend on regulatory frameworks and the necessary decisions being taken, and will also require a high level of cooperation between the Member States and the partners involved from industry and traffic planning (infrastructure). This includes in particular the coordination of various traffic regulations and legislation in the different countries and a uniform cross-brand system.